Working with preschoolers is SO much fun and they love pretty much anything you do! No need to be fancy! 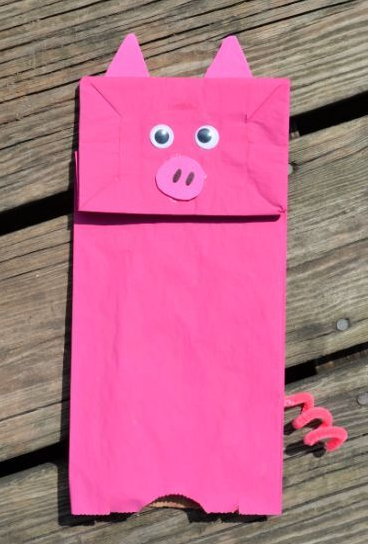 Paper bag crafts for kids are a huge hit since they double as an artistic craft as well as a puppet for imagination play. Paper bags can be turned into just about anything. 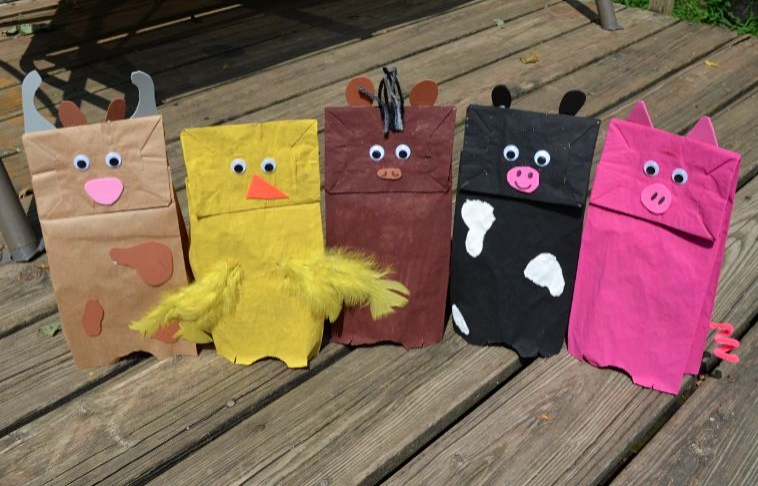 Check out below for some simple farm themed paper bag puppets! Baby chicks are cute and fuzzy so this is always a farm favorite for little kids. You can use construction paper, felt, fabric or craft foam if you don’t have the time for painting. Just pre-cut out yellow blocks of color for the kids to paste onto the bag. 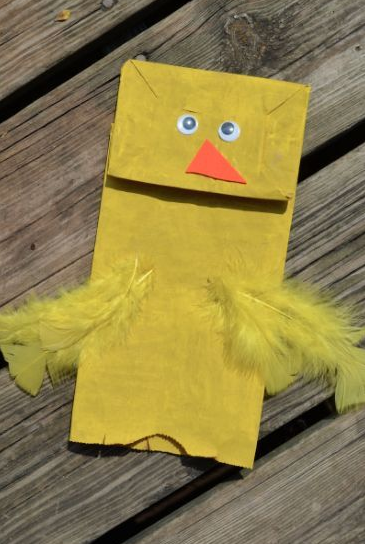 Add some googly eyes, feathers, and don’t forget the orange beak! You might also want to add some little orange feet too! OINK OINK! I’ve always loved the brightly colored pink pig and you absolutely MUST add a bright pink curled pipe cleaner onto the side of this one! Paint the whole bag pink. Glue on some googly eyes. Cut out small pink ears and a different shade of pink for the nose to glue on. We used craft foam to make it sturdier but you can also use card stock . MOOOO! If you’ve ever taken your preschooler to a farm they might have gotten the chance to milk a cow. There’s just something about those big white patches on black fur! 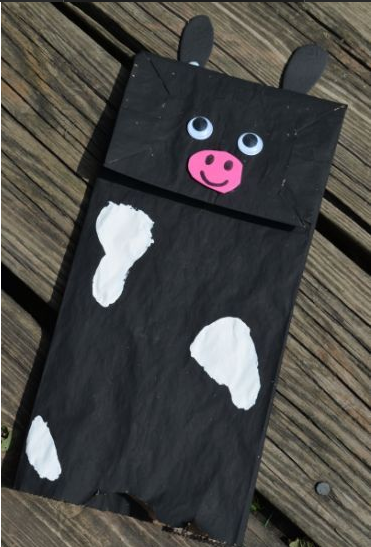 Paint on the paper bag all black, then paint or use felt to add white patches onto your cow. Don’t forget some black ears, googly eyes, and a pink nose/mouth area! NEIGH! Horses come in all sorts of colors but we chose a common brown look. What’s fun about this horse is that you should add little bits of yarn at the top for it’s mane. You can tape the yarn on behind the front of the bag or use glue dots or glue to add it on! If you really want to get creative add longer bits of yarn towards the back bottom of the bag for a horse tail. If you’re raising your cows for meat chances are you’ll find a bull in there somewhere! Tailor your colors to whatever you want your cow to look like but don’t forget the horns! 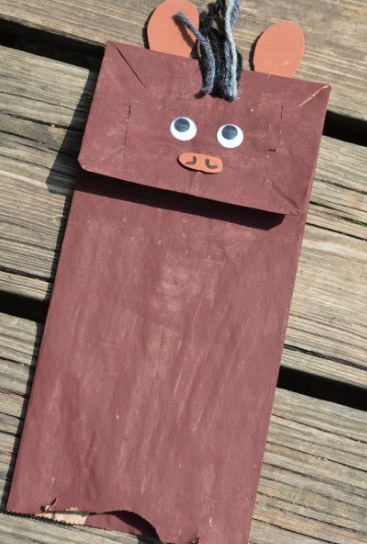 *Build a large cardboard barn and let the kids put on a show with their new puppets! *Have your child write the name of each animal and tape it onto the back of the puppet. *Spend one day on each puppet watching videos and learning about each animal. After you’ve gone through all of your puppets visit a local farm or petting zoo! *Sing “Old MacDonald Had a Farm” with your preschooler letting them grab the puppet to play with during each verse of that animal. You’re only limited by your CREATIVITY & IMAGINATION! 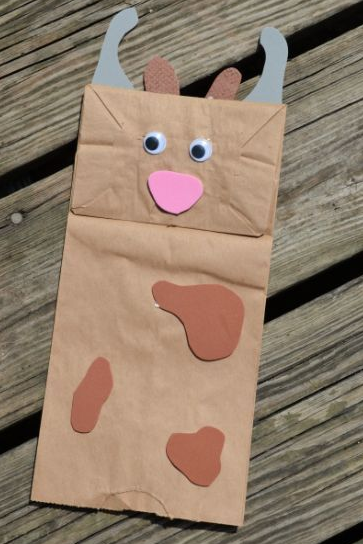 Want your farm themed paper bag puppet featured? Send your photo (and link to your blog post if you have one!) to survivingateacherssalary@gmail.com with the heading FARM BROWN BAG POST and we’ll feature your puppet and link back to you!